Safed Murgh or White Chicken Korma, also called as chicken in white gravy s a mild tasting curry recipe. 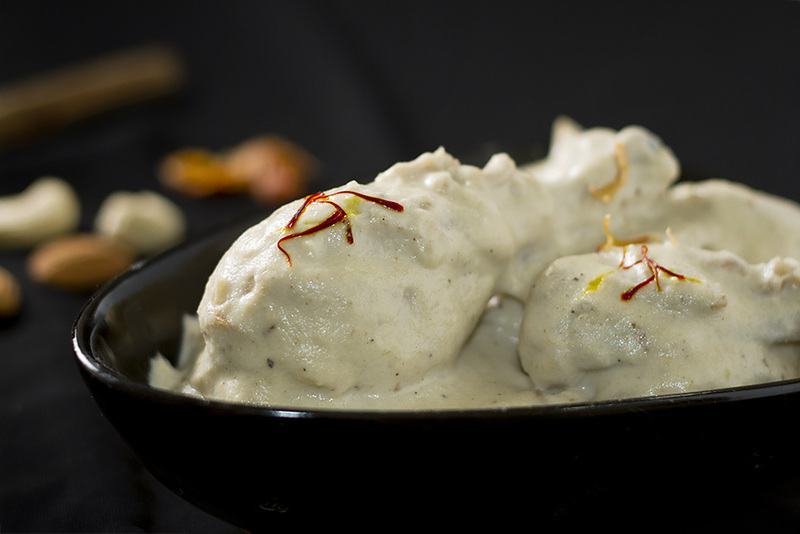 This easy chicken recipe has almonds and cashews which makes the curry creamy and delectable. This particular recipe is from a book by Camellia Panjabi called 50 Great Curries of India. If you want the gravy to be spicier, increase the amount of white pepper (double or threefold) as you are finishing the dish. The white pepper taste will blend in with other ingredients and will bring out their flavours. The word “korma” is derived from Urdu ḳormā or ḳormah, meaning “braise”, derived in turn from Turkish kavurma, literally meaning “cooked meat”. Korma (قورمه in Persian) has its roots in the Mughlai cuisine of modern-day India and Pakistan. It is a characteristic Moghul dish which can be traced back to the 16th century and to the Mughal incursions into present-day Northern India, Pakistan and Bangladesh. Classically, a korma is defined as a dish where meat or vegetables are braised with water, stock, and yogurt or cream added. The technique covers many different styles of korma. The flavour of a korma is based on a mixture of spices, including ground coriander and cumin, combined with yogurt kept below curdling temperature and incorporated slowly and carefully with the meat juices. Traditionally, this would have been carried out in a pot set over a very low fire, with charcoal on the lid to provide all-round heat. A korma can be mildly spiced or fiery and may use lamb, chicken, beef or game; some kormas combine meat and vegetables such as spinach and turnip. The term Shahi (English: Royal), used for some kormas indicates its status as a prestige dish, rather than an everyday meal, and its association with the court. Soak the almonds peel them. Lightly roast and soak Poppy seeds for about an hour, drain the water and grind the poppy seeds to a fine paste. Remove all water from Yoghurt by hanging it in a cheese cloth, and then whisk it. Heat half the ghee, add blanched almonds, cashews, cinnamon, bay leaf and fry. Add Cardamom, green chillies and Onions and fry till onions turn translucent. Add poppy seed paste and fry till it cooks through (about 4-5 mins). Add half a cup of water and bring the mixture to a boil. Cool this mixture and make a smooth paste of it in a food processor. Add the remaining ghee to the pot and add cloves, one whole chilli, ginger and garlic. Fry for a bit and add chicken pieces. Add salt and fry on hight heat till the chicken juices dry out, lower the heat and add yoghurt and stir continuously for about 5 minutes to prevent the yoghurt from curdling. Add the paste made of cashew, almonds, onion and spices to the chicken. Stir in the White pepper, nutmeg and mace powders. Add some water for the chicken to cook through. Taste the mixture.If you find it bland, add additional more white pepper powder. Cook over a low heat for about 30 minutes or until the chicken is tender. Garnish with strands of saffron and serve hot. Serve White chicken korma with steamed basmati rice or with butter nan.